Samsung finally took a bullet for the unibody team, and sealed the battery compartment of the Galaxy S6 and S6 edge handsets. Sixth time was the charm in the flagship Galaxy S line history that did away with Samsung's signature flexible design decision that gave you the chance to swap the battery at will if needed, or add extra storage via a microSD slot. This is why we wanted to ask you if you are unhappy that Samsung did away with its replaceable battery and expandable storage paradigm in the S6/S6 edge, or if you don't really care, as long as the battery life is decent and there is enough storage out of the box. Tell us what you think. and back it up in the comments. Not bothered about the battery (I have a spare battery for my note and never use it). Not too bothered about the storage either although it would have been nice to give people the option to use their memory cards. Considering you can buy portal WiFi storage options that will allow you to use micro SD cards. For example the Sandisk connects are only $50, and they support multiple platforms, allow you to use micro SD cards, and it's so small that you can attach it, and leave it always on your key chain, wallet, pocket, bag, purse, or briefcase. If you don't like that option, you can buy a $2-$5 USB otg cable, a $10 USB to micro SD slot option. There is always other options to look at. The other thing to consider is Samsung will most likely come out with another Active device that will give you the water proof option and maybe the micro SD card as well. I should clarify the S5 Active before still had a micro SD slot and was water proof. So maybe Samsung is also going to come out with a S6 Active option as well, that will not only address the water proof issue, but maybe they will put a micro SD slot in the new active as well. So you're ok with spending money on third party options because your "Flagship phone" does not have them? What about augmentation and functionality which should be a standard in a premium device? A flagship should have it all. Not just speed and looks. I'm very concerned on how people are spending their money nowadays. John B. Question - Do all "premium" cars have the same features? Because I don't even drive a "premium" car, yet I have features that cars that cost 2 times as much as mine don't have. For example, my car has a moonroof, 6 speaker Alpine Sound System with a 300Watt AMP and Subwoofer, rear camera, sdcard reader, support for iPod Out, even though Apple no longer supprts this, I have Bluetooth to mt phone, where I can read my text messages on the cars display and also reply, has Sirius XM and more. Yet I know several $50,000 Mercedes that don't have half that and I paid less than $30K for my car. I don't know how you define premium. However, sdcards and removable batteries are not premium features. In fact, those features appeared on cheaper phones and devices before these so-called premium devices showed up. What makes a phone premium isn't having every single features, its having the majority of the top premium needed features. In this cases the costumers wanted better cameras that can take pictures in any situation, they wanted better build quality and that is what they got. They also got some nicer features no one else has, like the fastest internal storage, the fastest CPU, they got the best possible display, they got the best cameras, they have the best design. Yet you're asking for something found on cheap devices? sdcards are not premium features. Even tho I need this feature, I don't consider it premium. Neither is removing the battery. What's premium about that? Cheap toys have removable batteries, does that make them premium? The device lose internal sdcard support, it didn't lose sdcard support totally. You can stull use an sdcard with any Android. I will happily pend $10 for a dongle to use my sdcard with an S6 Edge. "I don't know how you define premium. However, sdcards and removable batteries are not premium features. In fact, those features appeared on cheaper phones and devices before these so-called premium devices showed up." That's my point. Those with cheaper phones are not slaved to a failed battery or being able to augment their memory at will. The best computers allowed more flexibilities. I expect the same from my phones. Thanks for your input but I cannot recognize anyone that applauds taking more choice away from the consumer. It primes the market for higher than needed pricing. You can either trust me that has no financial gains for my input, or you can trust savvy marketing from the corporations. Which side of the wall are you on? John B. No, they clearly removed memory cards so that they could make more money. That is the only reason. Same with the battery. Don't defend a company you have no stock in. "The best computers allowed more flexibilities." Agree and this is one of those things most people don't understand with technology. You buy expensive gadget then get disappointed because all the features you're expecting are not included. Kinda like buying a $100 coffee without sugar and cream so you still have to burn more money for the added flavors or spending a thousand dollars for an alienware laptop with small memory and storage. If I want to get ripped off with expensive device, at least I want to get ripped off with everything I expect to be included in that gadget. "Cheap toys have removable batteries, does that make them premium?" So do expensive toy. So do a lot of other products that are not so cheap. Also most throw away items have sealed batteries. Does this make your flagship phone a throwaway item? It should. It only cost $200 to make and it cost you that when it come time to repair it. I work on $30,000 equipment that requires removable battery. And, if you're a musician, I would find it inconceivable that you would support a non-removable battery on your expensive wireless transmitter for mike or guitar. The weakest link in any product, will always be the battery. It's designed that way. Get back to the program and read up before celebrating today's practice of sealing in the most failed component. John B. These Samsung nerds finally got iPhone features (I.e. : glass back, built-in battery, no SD slot), so they can stand down. A $700 next-gen flagship that is a step down from the previous gen, waterproofing included. At least LG learned from their mistakes on the G2. That's alright, Trey Trey Treyvon and Tech 2 Hashtag Guy will be Sheepsung V2.0, sggosell can sell them some complicated keyfob or an extra pocket drive. I'm more than happy to go without the changeable battery as I have access to USB charging all day. However at first I was not overly pleased with the non-removable memory, but if I want the fastest available phone on the market, sacrifices have to be made. Lets face it, microSD cards slow down a phone. Having fixed storage allows Samsung to use it for caching, app storage, and minimise load times. That being said, the 128gb version is what I'm getting, and I've never used more than 80gb, so should be just right. Well, mark my words. You will definitely will be making sacrifices. You are purchasing a more expensive phone that Samsung has put together by decreasing its manufacturing costs in order to make more money, and even more money from you when it comes time to service it. All these benchmark tests are skewed. There is no doubt that the speed will increase. But, In real life, under normal usage, the speed differentials will be minimal. The industry is grooming you to fall for marketing propaganda. They want you to have no control whatsoever. And what I find interesting about these polls, is that last year the polls taken for the same interests of removable battery and SD card vs fixed, had 53% vs 47% in favor of the removable variants. This poll shows a wider gap in favor of the removable options. This tells me that everything I have been pushing and ranting about over the last 3 years, is that people are getting discouraged with the lack of accessibility and are rethinking the direction. Hence why HTC and LG reinstated SD cards. 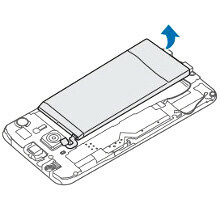 And LG also reinstating removable batteries on the G3. As I have always contended, the basic battery design in materials hasn't changed in over 2 decades and todays smart phones are taking its toll on this design. Just in 2 years, the cost for servicing these phones with sealed batteries has risen almost 50%. That's because the average person can't change their own battery anymore and the battery contributes to just over 30% of repairs. So if you think removable battery doesn't bother you, it may be time to put in some overtime at work. John B. What do you prefer? Glass or plastic? False. "Some" glass breaks to easy. Not mentioning any names, but the glass that appeared on one fancy phone back in 2009 that had glass on the back and front, only used Gorilla Glass on the front. The rear glass was a cheaper material that wasn't even gorilla glass. Just remember, there are lots of types of silicate used for different types of glass. The rear glass on the device I am speaking of, was the same cheap glass use to make Christmas ornaments. The S6 uses Gorilla Glass 4 on front an back which protects the metal underneath from scratches and dings from pockets and objects in your pockets and bags. I 'd say that was a very smart move. Sure it is a fingerprint magnet, So what. I always carry a small piece if microfiber cloth to wipe my device. You have to wipe the front glass, what's the big dal to wipe the rear once in a while? Doesn't matter. You can have a removable battery and sdcard support with either. It just depends on the OEM and how they chose to design. The vast majority don't use either. The ones who do, are smart enough to find workarounds that work. The above polls should be used an example that most people do prefer these features and are most likely used like myself. These polls even crossed over to mainstream polsters. The higher preferable percentage hardly qualifies as "Not using" them or wanting them. If you could have a premium phone that incodporates everything at the price you pay, you wouldn't purchase it? John B.
I had a spare battery for my S4 and I used it pretty often. It was a substitute for charging. If the battery in the phone was running low just take it out and pop in a new one. samsung fanboy is going to love the new designed of none expandable storage and none replaceable batter.. they just gonna love it. Samsung still can do better other than breaking their traditions. I'm most probably buying the 64 GB S6 ( sorry Edge) and I couldn't care less about removable storage. But I do miss the microSD storage. If it had a microSD slot, I would've got a 32 GB variant and put my 64 GB card in it.